Liquor that gives you that youthful glow? Sounds like heaven in a bottle. Pour me a glass! 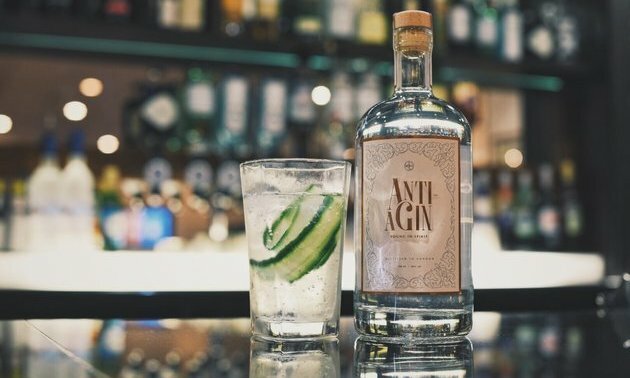 The headline-making Anti-aGin was created exclusively for the U.K. hotel chain Warner Leisure, which serves the gin at their 13 locations. Warner Leisure promises that the gin will “help people look younger whilst having fun.” Sounds great to me! But are the claims of the world’s first anti-aging gin backed up by science? That being said, there is some new research behind the idea that collagen taken orally does have health benefits. A study published in the Journal of Cosmetic Dermatology found that giving participants oral collagen over the course of eight weeks significantly reduced the signs of skin’s aging. Researchers reported that the skin’s collagen density increased while the breakdown of the skin’s collagen networks decreased in just four weeks, with the youthful effects of taking regular collagen supplements lasting more than 12 weeks. So the dermatology community is still split on the effectiveness of collagen-infused health drinks. But here’s the other thing we need to talk about: Anti-aGin is 40 percent alcohol. Can alcohol ever really be a health drink, or is this just a case of wishful thinking? The dream of an alcoholic facial seems to resonate with a lot of consumers, as the gin appears to be flying off shelves. When I checked to see if I could get my hands on a bottle of Anti-aGin via the U.K. retailer DrinkSupermarket, which ships internationally, it was sold out with promises of being back in stock soon. But are all of these people really going to look younger while getting a little tipsy? The jury’s definitely out, and personally, I wouldn’t count on it. That being said, if you want to indulge in the latest health fad, no judgments here. I just wouldn’t hold my breath for anything other than a fun night out.